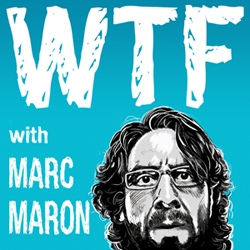 As a big fan of stand-up comedy, I’ve become addicted to Marc Maron’s interview podcast, WTF. It recently aired its 200th episode, an interview with Maron himself, done by hilarious Boston-born comedian Mike Birbiglia. In the midst of the interview — which is at turns funny, touching, and fascinating — Maron said something very profound about comedy, which I think could be extended to all art, and definitely to the world of cultural organizing. If we extend this beyond comedy to other art forms, I would argue that we end up with a fabulously succinct definition of the goals and power of cultural organizing. It doesn’t cover everything, but let me break it down for a moment. 1. Cultural organizing seeks to make people “see something in a different way, completely.” This touches on the ability of cultural organizing to transmit new information. But more importantly, it captures cultural organizing’s power to challenge, shift, and even replace the stories we live inside. We understand the world through stories we are told (some call them dominant narratives, others discourses, but as a writer, I like to think of them as stories.) Community and movement organizing have long understood the power of storytelling, and cultural organizing places this aspect front and center — highlighting stories that are marginalized, and crafting new stories that empower. These stories are offerings of sorts, new frameworks through which we can see the world with fresh eyes. 2. Cultural organizing makes “people feel less alone.” Cultural organizing connects people with one another, whether by gathering around a shared culture, or by creating spaces in which culture can be shared across lines of difference. Cultural organizing — like all good community organizing — expands our ideas of who is included in “we.” Through art and cultural practice we are able to build relationships both because we are more connected with ourselves, and because we open ourselves up to others. This process builds social capital, a key ingredient in power. Meet the UndocuArtists: Using art & culture for immigrant justice, & much more!